"Procrastination, thy name is . . . "
I'm sitting here in my office with a goodly sized project staring me clearly in the face. So before I dive into the last details of the story boards, space plans, and budgets, I thought I'd take a mental break and scan through the newest edition of Traditional Home that arrived on my desk this afternoon. I'm also avoiding getting messy Thai food all over the blueprints this way. Wow. I just love what architect William T. Baker and interior designer Suzanne Kasler have done for this gracious home outside Indianapolis. The space just feels so calm and serene. And the simple, clear colour story certainly assists towards that goal. Who wouldn't want to face the day after waking is this spectacular bedroom? 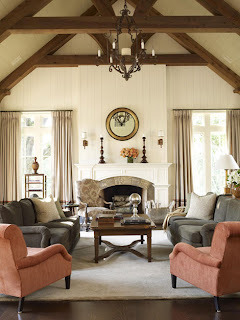 I also love when I see an 'iconic' element that I've used in one of my own projects, such as the whimsical twig light-fixture used here over the family room's dining table. 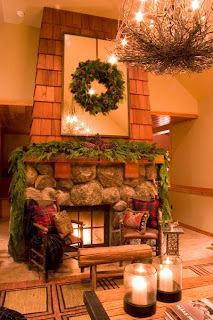 And here it is again, in all its holiday glory, from a client's home in Lake Tahoe photographed last Christmas. "Leaning towards Spring . . "
It's been a bit grim around SF for the last week and I just feel like I need some fresh colours and gracious design this morning. Love the colour palette, the mix of styles, the amazing wall treatment, and the addition of the ethnic print table cloth just to keep things interesting. 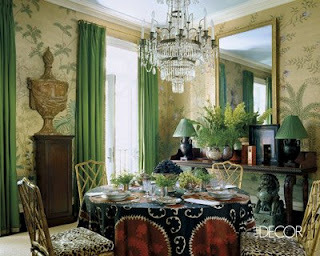 Miles Redd at his very best. and, wow, just love it. 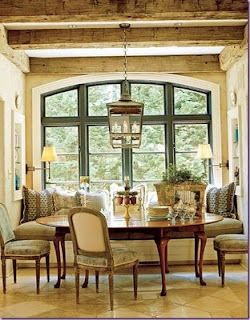 Love the lighting, love the furnishings, love the view, and would love to enjoy a meal with good friends in this charming nook. "Herding Gypsies . 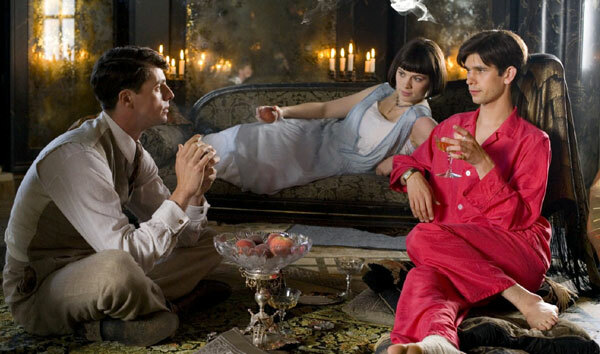 . . "
The cast from Gosford Park. I have always believed that living an elegant, gracious life involves some (and at times a great deal of) effort on one's part. It is easier to eat dinner in the kitchen . 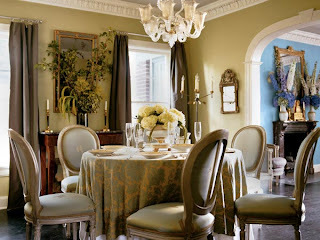 . . but it takes some time to set a beautiful table and celebrate the evening meal. And those freshly ironed monogrammed linen guest towels don't happen by themselves. The daily duties of laundry/bedding, dishes (especially antique pieces that need hand-washing), and housekeeping all take a focused effort to maintain. It started several days ago when I decided that the dinner dishes could wait until morning for washing . . . and the day's wardrobe could remain draped across the armchair in my bedroom and would be sorted before heading into work the next day. Well, as stated, that was several days ago and . . . things have not gone well, lol. Now my Saturday is focused on re-claiming the gracious way of life that I pride myself on. It's a code word amongst my friends whenever one of us gets into this position that "Oh, please don't come by the house this afternoon. There seem to be gypsies staying here." "and they seem to have livestock." 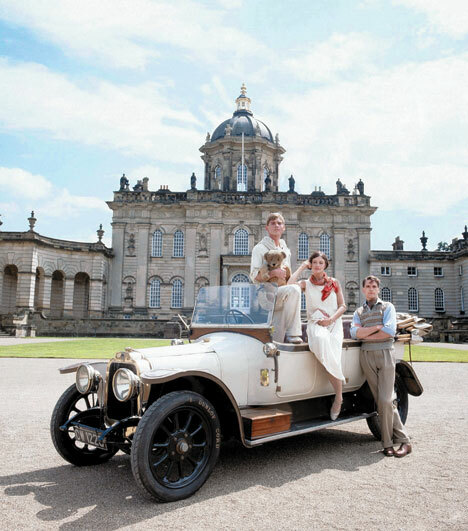 Ah . . . . "Brideshead Revisited, The Sacred and Profane Memories of Charles Ryder." 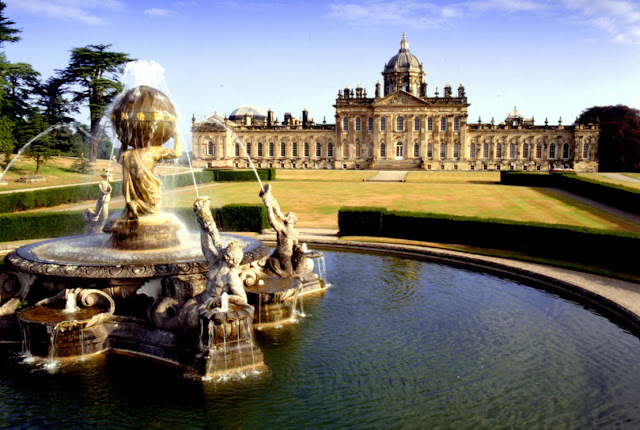 There are always those touchstones that seem to continue to influence one throughout one's life and Evelyn Waugh's masterpiece from 1945 is one of mine. I received the DVD of the new film yesterday and have been watching various bonus tracks and commentaries since then. And, my, it brings back memories . . . . 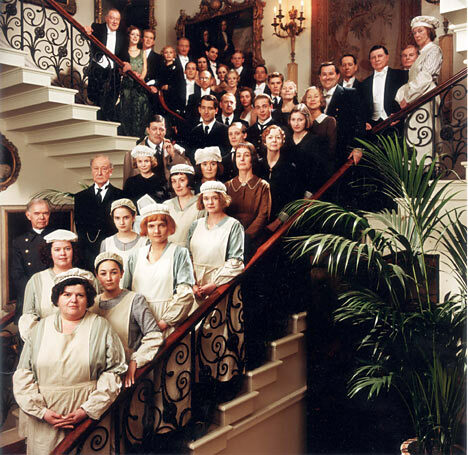 I first met the story, in a different form, in the early '80's when I watched the PBS mini-series based on the book. Thanks to ArchitectDesign for reminding me of that story . . . and to Netflix, for sending the film right when I needed to see it. "At Last . . . "
Yesterday was just such an amazing day. One of the new facets of the day, for me, was seeing it through so many differing vantage points. Watching CNN for the 'big news' point of view. Watching the local news stations for some more 'local interest' stories. Constantly 'refreshing' my facebook 'status' page to keep up with folks visiting D.C. and a few lucky friends (yay, Rice!) who were taking part in the parade. Talking with friends at home by phone. Swinging through blogspot to see who was posting directly from D.C. And at 12:01 pm, seeing the new White House website launch. It was just such an emotional day, and yes, there were tears several times over the course of the morning and again last evening seeing the new first couple dancing at the various Inaugural Balls. Great dress on Michelle by Jason Wu. and great speeches by Barack. And today, we get on to the work of creating the future of our country. "Home, Sweet Home . . . "
I, like so many Americans, am awake early to watch the momentous events in Washington D.C. this morning. I have several friends in D.C. taking part in various events and I don't quite know what I'll do if I see one of them on television. lol. This evening, after a long day and numerous balls, the Obama's will head home. To this historic home. To our nation's home. To their *new* home for the next four years. I had the honour of visiting the White House whilst I was vacationing in D.C. during a summer break from college. It was truly a breathtaking experience. After seeing photos of the space throughout my life, it was staggering to be standing in the East Room, or the Green Room, and feel the history of our nation wrapping around you. 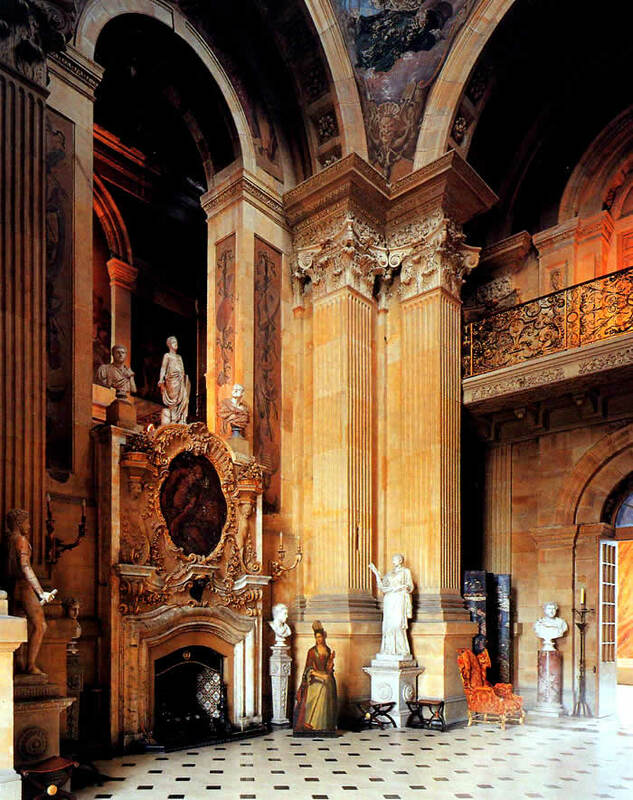 The images above are from the March 2008 issue of Architectural Digest that featured the interiors of the 'public' rooms of the White House. Each presidential family leaves a mark on our nation history, and as well, will leave a mark on our nation's home. I sit here quietly in the dark, excited to see the future of our nation begin to unfold. "Hail to the Designer . 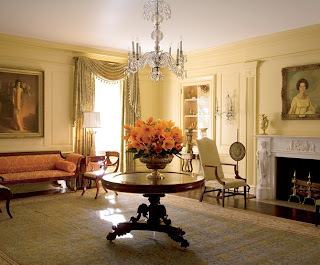 . . "
I was delighted to hear that one of my favourite designers, Michael S. Smith, would be handling the interiors for the Obama's family quarters in the White House. I own several of Michael's design books and always had the greatest admiration for his sense of style. "Santa Monica designer Michael S. Smith has won the commission to redecorate the White House living quarters for the Obama family. 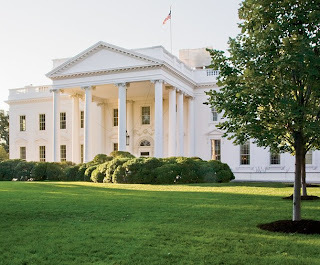 "He sounds like a wise choice, with his interest in traditional though not pedantic museum settings," said historian William Seale, author of "The President's House: A History." 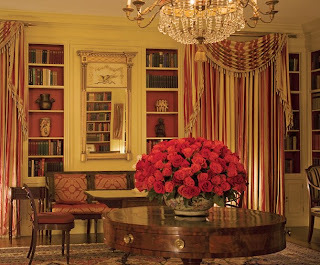 "What works best in the White House is someone who is immersed in the past and can design in a modern way." While working with clients such as Steven Spielberg, Dustin Hoffman and Cindy Crawford, Smith has achieved a reputation for balancing the glamorous and the functional, the modern and the classic. " I have always found Michael's work to be incredibly stylish and modern, yet slyly simple. I can't wait to see what he, in partnership with the Obama's, is able to create for the private living space in the White House. "Lights, Camera . . . "
Please pray fervently for me . . . lol. I've got a TV interview tomorrow afternoon and I have *NO* idea what I'm going to wear. 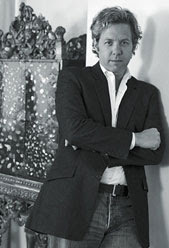 Tim Gaskin of "OUT Spoken" is going to do a segment on my installation at Dining by Design last Novenber . It's been fun spending the last few days thinking about the fun (and horror) of that event. I think it will be broadcast the second week in February, but I'll let you know when the episode airs. So tonight, in a mad effort to calm my nerves, I've been looking through some old 'inspiration' images that I keep in my files. It's one of my dream projects . . . either as an owner, or (maybe even better) as the designer. 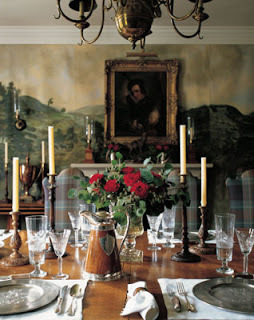 The shots are from Ward Denton/Christopher Gardner's design for Glen Feshie Lodge in Scotland. 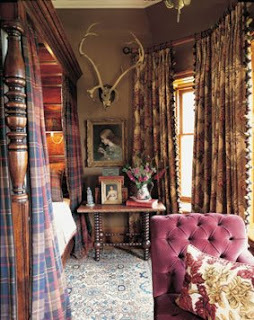 I'm sure we're all clearly aware of my love of tartan and I love the subtle use of plaid textiles and beautiful antiques. The custom mural from the dining room are images of the surrounding property. I have always been deeply impressed with what Ward and Christopher were able to create. "How do you solve . . . "
Welcome to 2009. For some strange reason, I've been drawn to these calm, neutral colours of late as I've been flipping through design magazines and checking out new publications online. Maybe it's a desire for the 'cleanliness' of a new year. Maybe it's the monochromatic colours of the winter weather here in San Francisco. Maybe it's a preview of the palette for a new project that's working itself out. I always love when new clients have a file full of torn out pages from design magazines. It is endlessly fascinating to work through them together and begin to find the 'common threads' that connect them. Sometimes it's as easy as a colour. Sometimes it's the way artwork is displayed. Usually though, it's more obscure . . . it's about the way these rooms make one feel. 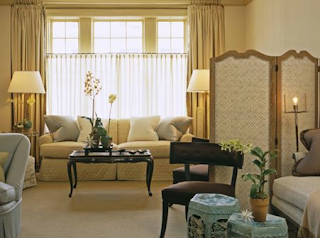 As the new year begins, start thinking about the rooms that inspire you. Maybe start collecting images that bring a smile to your face. No matter how grand and meager your surroundings may be, there are always ways to make yourself happier within them. I keep collecting pictures even though I don't quite know what they will mean. Because when the time comes, I'll see the connection.